Blogging is a great way to share your interests and ideas while making a profit out of it. However, starting a blog is not as easy as one may think. You need to choose a topic and stick with it! Sometimes, even coming up with an idea is difficult. In this article, we’ll share 25 blog ideas to help you! Before picking a topic, you need to know how to set up a blog. First of all, you need to choose a platform – the software that you will use to create your blog. Today, you can find many options, including Weebly, Squarespace, and WordPress. Note that some platforms are self-hosted, while others are not. Self-hosted platforms store your blog and its database inside their server. Others require you to have a hosting service. To ensure your blog’s performance, you should use a hosting plan with great uptime. After choosing a hosting service, you’ll need to install your blogging platform on it. Many hosting service providers offer easy installation tools for popular platforms like WordPress. Afterward, you need to get a domain name. It is the address that your blog will use. Be sure to look for a unique name that is relevant to your niche. Try to come up with alternatives, in case your main choice isn’t available. Lastly, you need to set a theme and some add-ons. The theme forms the appearance of your blog, while the add-ons provide features. Blogging platforms usually have many free themes and add-ons to choose from. Not sure of what to blog about? Here is a list of the 25 most popular blog ideas. We will discuss why people read them and what you can write on the same subject! People want to find an unbiased opinion on a product or a service before buying it. For that reason, online reviews are always in high demand – especially for things that are in trend. If you can write high-quality reviews, your blog will definitely get traction quick! Additionally, if you write long enough while keeping your content high-quality, readers will regard you as an expert in the industry. However, you should aim for a specific industry. If you are interested in more than one, it is better to make a separate blog for the others. When writing reviews, you cannot cater to only one brand or company. Including some pros and cons for each product that you cover will give you more credibility. If you have a great deal on knowledge in a particular field – writing how-to articles is a great blog idea. Today, most people look for solutions online. With that in mind, there is no reason why you should not share your knowledge and skills on the internet. One of the ways to do it is through writing how-to articles. The first thing people do when they need help with something is googling it, after all! Depending on your content, you may aim for readers who want a quick fix or experienced people who want to improve a project. The possibilities are endless! Beginner guides are similar to how-to articles. But as the name implies, they focus more on readers who never learned about the topic that you’re covering. If you’re into helping people learn – beginner guides are a great blog idea. If you are a cooking enthusiast, opening a recipe blog can a great blog idea. We recommend you write original recipes! Expand your, and your reader’s culinary horizon. For instance, you may discuss other people’s cooking, review kitchen tools, try foreign ingredients, and much more. Should you be looking for inspiration, check this example from Food52. Food52 doesn’t only talk about food. In this blog, you can also find posts about interior design, restaurants, and drinks. It even has a shop where you can purchase furniture and cooking appliances. Building a blog that covers national news may be a bit too hard if you are just starting. After all, you do not have to compete with big news agencies. Instead, try to write stories surrounding the topics closer to you. Look for recent events in your area or cities around it. As a fan of street art, for example, you may report on relevant events happening in the city. Even though you are starting small, establishing your tone is crucial. Of course, you need to adjust it to your target audience! Finding a language style that your readers enjoy enables you to connect with them better. Other than writing reviews and guides, giving advice is another option for helping others and creating content while doing it. Many online advice columns involve life issues, but you can talk about different topics too. No matter what your niche is, you can run an advice blog in two ways. You may write articles about issues that your readers have, or on the other hand, your blog can have a live chat feature. If traveling is your hobby, you can share your experience through a travel blog. Online travel journals are not only entertaining but also helpful for those who share the same interest. There are many types of posts you can make as a travel blogger. The articles you can write include culinary adventures, hotel recommendations, and budgeting advice. More and more people are moving towards a healthier lifestyle. For that reason, having a fitness blog is a big prospect! There are many things that you can talk about surrounding fitness, depending on your field of expertise. Workout coaching, nutrition advice, and mental wellness tips are only some of the topics you can write about. With a fitness blog, you can also market your service! Check Badass Fitness for example. Shannon, the owner of the blog, is an experienced trainer who specializes in the Tabata style of workout. Using her blog, she inspires people to join her training camp in Florida. It is crucial to know how to protect ourselves in dangerous situations. However, it does not always require martial arts skills. Today, people can learn self-defense techniques from blogs. It is a growing topic, and you can make a popular blog out of it. The kinds of posts that you can write include security advice, self-defense moves, and non-lethal weapons. Many people like to decorate their house without spending too much. That is why thousands love blogs about DIY crafts. However, you can have a DIY blog about subjects other than home decoration. Cosmetics, accessories, and daily life hacks are some of the ideas you can use for your posts. Who does not like video games? The game industry is big! So a blog about video games can get huge! If you want to make a gaming blog, writing walkthroughs is a great choice. These guides are helpful, especially for difficult games. Walkthroughs attract readers, especially if they are about famous or trending games. Gardening is a sought-after topic, especially for those living in the city. You can benefit from it by opening a gardening blog. There are tons of ideas about gardening you can talk about. Should you run out of inspiration, visiting Stephanie Rose’s Garden Therapy will help. Garden Therapy does not only cover gardening techniques and tools. In this blog, you can also read about crafts and making cosmetics out of plants and fruits. Digital technology makes photography accessible to everyone. Consequently, more people are aspiring to be good at it. With that in mind, having a photography blog is a big advantage. Monetizing it is easy. For example, you can make an online photography course. Photography blogs can also work as a portfolio. On the other hand, some photographers share their works as a diary. Some people use the internet to unwind. To do it, they usually search for unusual, yet entertaining websites. Sometimes, however, those kinds of sites are tricky to find. If looking for sites like BuzzFeed and Bored Panda is your pastime, you can talk about them in your blog. Even though it sounds odd, blogs sharing interesting sites generate a lot of traffic. Teaching online is a way of increasing your income as a musical instrument instructor. You can do it by setting up a blog. To attract potential students, you may offer a free trial. Show off your musical skills! It might lead people to show an interest in your service! Learning a new language is a fantastic undertaking. For some people, though, it can be a tough experience. But language learning blogs make the task easier. In a language blog, you do not always have to post lessons. Check out Ellen Jovin’s Words and Worlds of New York. In her blog, Ellen talks beyond the grammar and vocabularies of languages in the Big Apple. She also posts about language books, conferences, and foreign eateries. There are many platforms for building websites today. Because of that, web design is one of the hottest topics to blog about. Blogs about web design usually serve as a learning platform for developers. The types of posts that you can write could include website builder reviews, coding tips, and best features to be aware of. This is a great blog idea if you’re into website design! Opening a blog for your interior design firm helps bring more clients. To do that, you need to engage potential customers with useful posts. For example, you may talk about decorating advice, best color combinations, and furniture reviews. Even better, you should show your designing process. If sports is your obsession, starting a blog about it can be a really fun journey. You can treat the blog as a news platform. For instance, news about college football matches or local marathon events. On the other hand, your blog can also review sports equipment or venues. Blogging about animals can be both entertaining and educational for internet goers. Let’s take pet blogs for example. Apart from showing the cute daily lives of pets, they also share tips on pet parenthood. Some other animal blogs advocate against animal cruelty. 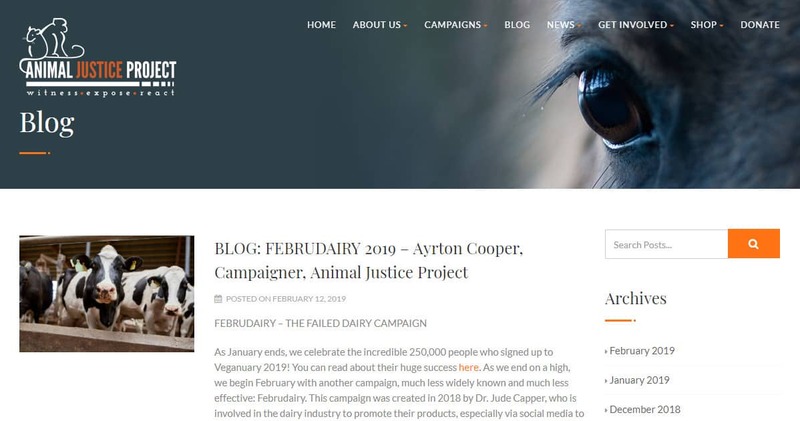 Take a look at the Animal Justice Project. Apart from spreading awareness of animal welfare, the nonprofit organization also invites people to join their cause. There is no school that will teach you about life, and many people are not happy with their lives. Because of that, they take refuge in self-improvement blogs. From organizing one’s mind to finding the perfect food for a healthier body, there are many topics to write for this type of blog idea. Working in a company may not be for everyone. Today, more and more people are becoming entrepreneurs and freelancers. However, starting is not as easy as many think. Self-employment blogs can serve as a great guide for the people interested in this lifestyle. Most of them usually talk about how to make connections as a freelancer or how to make a good schedule. Speaking in front of the public can be a scary experience. Thankfully, there are quite many blogs that guide people to become better speakers. One of the big names among public speaking blogs is TED Talks. TED Talks is the center for presentation videos. The blog covers diverse topics, but you can also find seminars that teach public speaking skills. Living life to the fullest while spending less is becoming more and more popular. The number of blogs discussing it is also increasing, so it’s a great blog idea to explore. If you want to motivate others to be thrifty, choosing this blog topic can be a great blog idea. You can post about recipes, recycling, and other aspects of simple living. Do you love to share stories? It is one of the most favorite blog ideas, especially if you aspire to improve your writing. You can also let others post in the blog. By doing this, you will learn from others as well. Apart from the ones above, there are many other blog ideas to use. If you can think it – you can blog it! Feeling confused? Think about what you’re best at! People will be interested in your blog if you are confident with what you write in it.